This recipe can be cooked in a microwave, making it easy for busy households! Microwave: In a microwave-safe dish, arrange pieces of chicken, meatiest pieces to the outside of the dish. Cover with wax paper. Micro cook on high for 8 minutes, rearranging pieces twice. Drain off fat. In medium bowl, combine cranberry sauce, onion, ketchup, mustard, brown sugar and salt. Spoon over chicken. 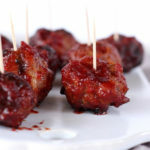 Cover with waxed paper and cook on high 10 – 12 minutes or until chicken is tender; basting chicken and rotating dish once. 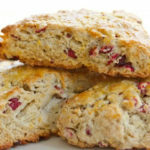 Remove chicken, reserving cranberry mixture and skim fat from surface. In a small bowl, mix water, vinegar and cornstarch. Stir in cranberry mixture and micro cook about 2 minutes or until mixture is thick and bubbly, stirring after every minute. Return chicken to dish and micro cook 1 minute longer. 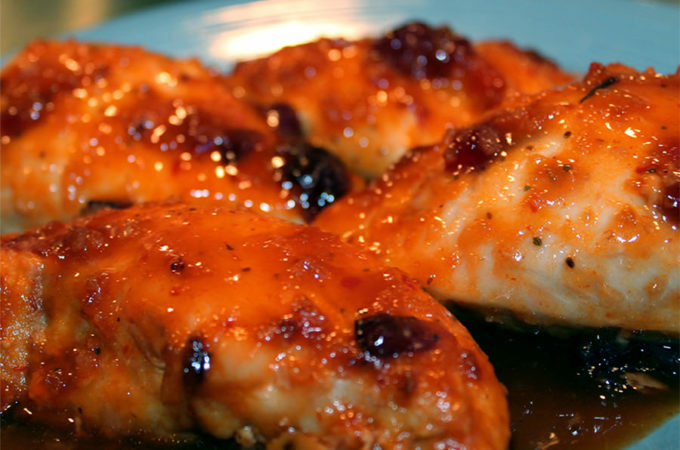 Oven: To bake in a conventional oven, place cranberry mixture over chicken in a pan. Cover with foil. Bake at 400ºF (200ºC) for 45 minutes. Remove foil, baste and bake for 15 minutes longer to brown chicken. 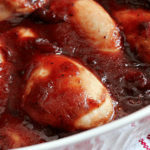 Remove chicken from pan and mix vinegar-water cornstarch mixture with remaining sauce in pan and cook over medium heat until thickened.